The festival shared the news in a statement today. In a statement released today, Afropunk has announced that M.I.A. will no longer be headlining the London festival. The addition of M.I.A. to the festival lineup initially received backlash due to the London-based artist's comments on the Black Lives Matter movement. M.I.A. took to Twitter following the controversy, announcing that she would be pulling out Afropunk, but the festival confirmed that she would remain as a headliner in an official statement in June, writing, "The fact that M.I.A. 's comments sparked dialogue about a global view of the black struggle is not a failing." In the statement released today, Afropunk organizers reversed their decision. "After discussing the situation with the artist and the community, a decision was agreed upon by all involved that M.I.A will no longer headline Afropunk London,” they confirmed in the statement. The festival, which will take place in September, will release the second wave of artists and new headliner on July 19. 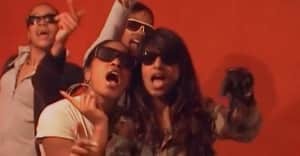 Representatives for M.I.A. and Afropunk were not immediately available for comment.